Sons of Taurus: Workbench: Walking Dead and more! I've made some more hobby progress this weekend. Above are a pack of 25 zombies, waiting for me to get around to repainting Typhus. In the meantime they may see use in some RPGs, especially and appropriately enough the zombie survival game we started up a few months ago. They originally saw "life" way back with the Lost and the Damned from the Eye of Terror codex. I've touched them up a bit, based them and added some gore. Normally I avoid that on models, but with gaping wounds and being flesh-eating monsters I thought it appropriate in this case. These guys have come from a feast of their previous victims. 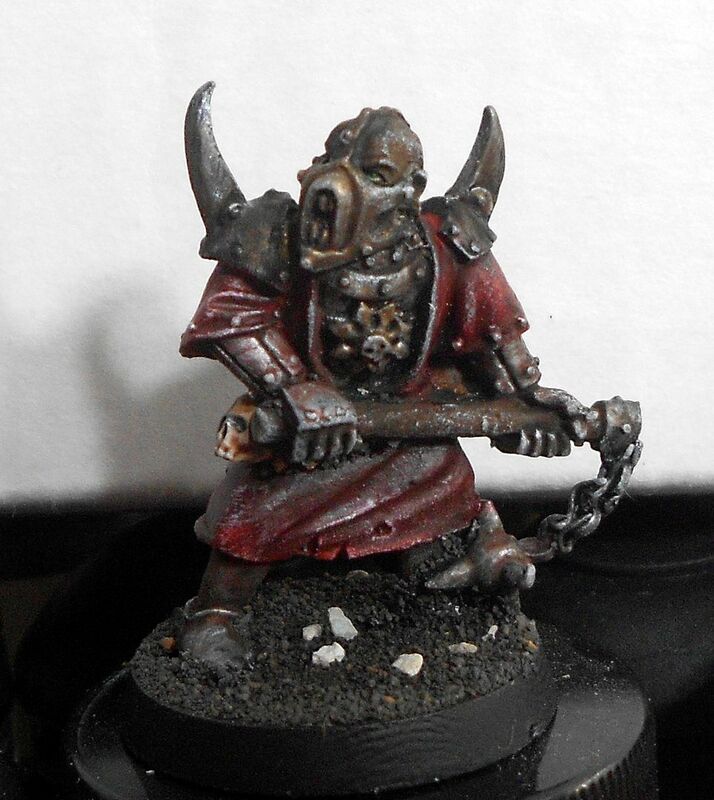 To make the gore stand out more (already does a bit with pale zombies and grey outfits) I had already matte sealed the zombies before adding the blood, which was a mix of paint with some transparent black and red added in, with gloss sealer brushed on the blood after it dried. Hopefully it will stay more wet looking over time. Next up are the Warp Talons for my Endless Ones. A little touch up, basing and sealing since last they were seen a few posts ago. I still need to brush over the basing material, but other than that they should be finished. I don't have really regular Space Marine opponents right now, so for the helmet on the base of the one on the left, I went with a Dark Angel, both for my unfortunately infrequent DA opponent Seneca plus I figure I would be seeing more of them in the future with Dark Vengeance and the new codex. Not sure which one will be the Champion at the moment. I originally thought that the dragooned chosen figure (bottom left) would be it, but the two in the middle have grown on me with their open-clawed poses. Any favorites? Maybe I'll try each of them out in a leadership role in games and see who performs best. Let the dice and the gods decide. On the other side of the ideological spectrum we have some servants of the Emperor, and autocannon squad for the Merkan 76th Imperial Guard. 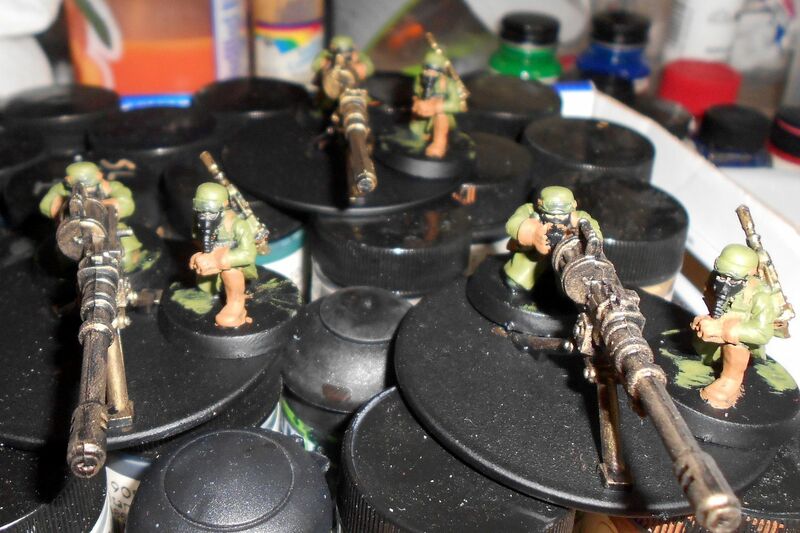 They've had some basic colors slapped on, still need details, basing, and shading. Shouldn't take too long. After having done full IG armies, six troopers seems like nothing! I've also sprayed the basecoat on the counts-as Hydra for the Merkans; more work on that in the near future too hopefully. Last but not least in his own eyes, a regular company commander for the Scythiak Usurpation, so that I can run a command squad without needing to pay for Straken/Astrakenor. Not sure yet what I'll name him. The mask and the skull trophies have made me think of Hannibal the Cannibal; maybe that will stick. In sticking with Scythiak traditions, I'd be open to other names if someone wants to adopt him. 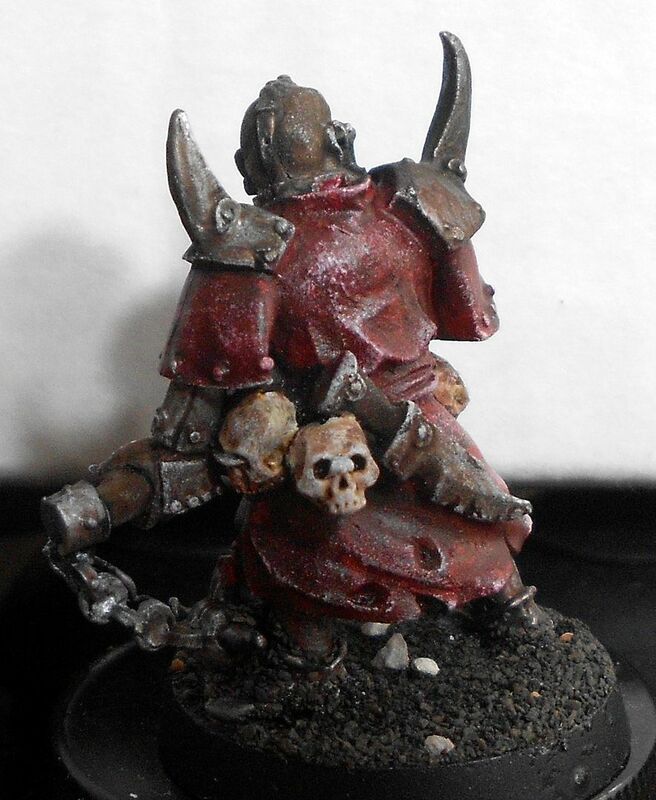 The figure is from the Mordheim Chaos warband. Still needs some touchups and overbrushing on the base, but overall I like how he's turned out. May add a symbol or something on the back, but not sure yet. Everything looks good, especially those zombies! Linking time no high five. The wings on your raptors really pop. I also dig Hannibal the cannable, great work. @Slicksauce - Thanks, and welcome! @HOTpanda - No idea what the first part means, but thanks for the rest! Hannibal is sweet sir. Really looks to be a nasty piece of work. Thank you sir. Tamiya Clear Red certainly featured as part of the mix, but it also included a "smoke" (transparent black) and a reaper deep red.